The Next Web’s USA Conference returns to New York this coming December. Our events team have delved into the inner workings of the US city, in order to understand what is making it such a hotspot in the tech startup scene. It’s 2008. You overhear two people in a trendy bar talking about the East Coast’s answer to Silicon Valley. Your instant assumption? No doubt Boston. Home to MIT and Harvard University (the dorm rooms of which served as the birthplace of Facebook), the city was long considered tech’s home away from home. If you overheard the same conversation today, chances are you would be confident they were talking about New York. In just half a decade, the NY tech scene has exploded. And while it’s still far from rivaling the monolith that is the San Francisco Bay Area, it’s also managed to outstrip every other US city. In fact, between 2009 and 2013 the amount of capital invested in New York tech companies each year has soared from $799 million to $3.1 billion. In total, almost $10 billion has been invested in the NY tech industry in the last 5 years. But it’s not all about capital. There has also been a 33 percent increase in tech jobs in the city over the same period. That’s 4 times the job growth seen by the rest of the New York economy – something which is also set to grow further once Cornell University opens its two-million-square-foot, next-gen technology campus in 2017. Photos from our New York conference in 2013. While investment in Silicon Alley doesn’t quite run as deep as Silicon Valley – with Bay Area backing last year sitting at a little over $11 billion – the fact that the Big Apple is now the USA’s second city when it comes to tech is undeniable. So what set the stage for the city’s startup success? According to Bruce Katz & Jennifer Bradley in The Metropolitan Revolution, despite technology’s ability for emancipation from physical locations and limitations, it still tends to flourish “in fairly compact geographic concentrations.” Here, NYC has an unquestionable advantage. As the most populous city in the United States (and even one of the most populous in the world), New York is as compact and concentrated as a geographic location can pretty much get. Wall Street. Need I say more? If an allusive location isn’t enough for you, New York still ranks number one in most top financial centre indices. It is no surprise therefore that the city has given rise to a number of hugely prominent venture capital firms, start up accelerators, and angel investors. Aside from the huge investment figures outlined above, the city is also home to the likes of BoxGroup (the investors behind Behance, 9GAG and Vine), Union Square Ventures (think Twitter, Foursquare, SoundCloud), Bain Capital Ventures (with $67 billion under management worldwide) and many others. With such a strong investment industry, New York is a good location for getting early-stage startups off the ground. This is helped along by a healthy selection of startup incubators, such as Prehype and Betaworks, as well as growth programs, including The Next Web’s very own Boost program. As expensive beauty products and fashion accessories regularly remind you, New York has traditionally dominated the fashion world alongside London, Milan, Paris and Tokyo. It’s not all about historical convention though, as NYC has also taken the top spot this year in the annual fashion capital rankings. And if you’re looking for industry disruption, the New York tech scene has its claws more than skin-deep in beauty and fashion. In fact, it’s waging all-out war on commerce in general. Birchbox, for example, has convinced 800,000 people to receive beauty samples each month at $10 a pop. As a result of its innovative business model, the company recently garnered new investment of $60 million, putting their current valuation at almost half a billion. And then there’s Warby Parker, the online eyewear retailer, and Harry’s, the online male grooming retailer. Both operate using a ‘v-commerce’ – or vertically integrated – business model, that sees each respective company design their products in-house and sell directly to the consumer. If the disruption that this could cause to traditional industry wasn’t enough, both also offer a donation program whereby every item purchased sees a similar item given to a person-in-need. Alongside these market leaders, New York also has a whole host of other ecommerce sites in the mix – including Fab (which has more than 10 million members) and Etsy (more than 30 million members). It’s also home to popular lifestyle and fashion publishers such as Condé Nast, who are in the process of digitizing their content offerings themselves – another major playing field for the city. Aside from being the most commonly portrayed city in media history (probably), New York City’s own media industry is also one of the most prolific and influential in the world. Its home to some of the most prominent publishing houses, newspapers, record companies and TV studios. Not to mention some of the leading online media outlets and publications. In fact, according to Dr. Michael Mandel in “Building a Digital City,” it is the unification of the city’s publishing, media, and entertainment industries with its tech startups that has caused such a rise to prominence. Culture seems to breed culture, or in other words: where you find News Corp., NBC Universal, and The New York Times Company, you’ll also find Huffington Post, Buzzfeed, Upworthy and Business Insider. The comparison can easily stretch to other aspects of the cultural industries. Three of the “Big Four” record labels are headquartered in New York, as well as MTV: the city is also home to 8tracks, The Hype Machine and Genius, which started life as Rap Genius. Time Warner and a third of all American independent films? Vimeo and Vine. Okay, from feature-length films to Vine is a bit of a stretch, but the app has bred an entire subculture, (after all, twerking wouldn’t be what it is today without the 7-second video app). The same can be said for images and Tumblr. That’s based in New York, too. We’ve barely scratched the surface of what New York’s tech scene has to offer – a thought that also occurred to us when we were setting up our first New York conference this time last year. If you’ve ever attended a TNW Conference, you’ll know that we have two goals: 1. to bring together an eclectic mix of individuals from across the tech industry, enabling them to do business – and 2. inspire everyone in the process. This year, we think we’ve upped the ante once again. For the first time, our New York conference will feature Boost, our startup growth program sponsored by WeTransfer. That’s not to mention speaker appearances from some of the industry’s most interesting influencers – many of whom are involved in a number of the companies mentioned in this article. Click here to find out who they are. 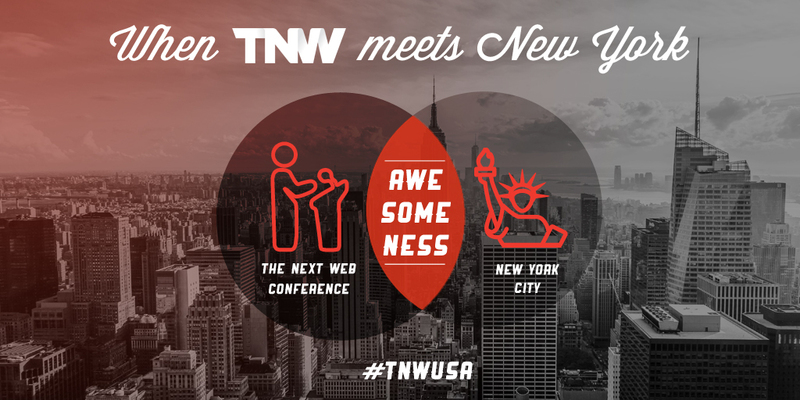 ➤ Limited early bird tickets for TNW USA on December 10th are still available. Click here to save $205.